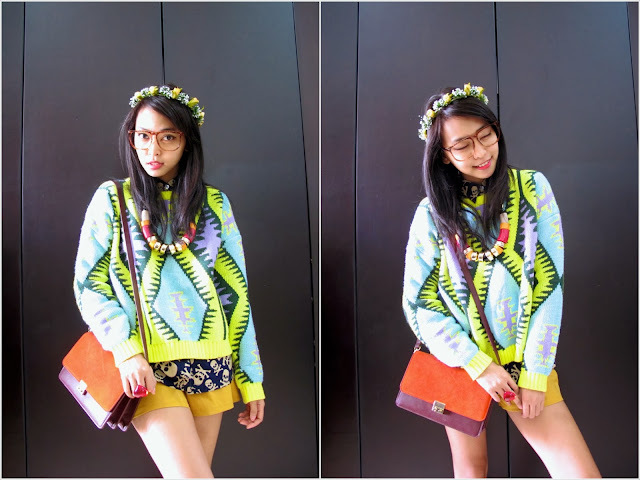 Today I'll share with you another comfortable outfit to try. 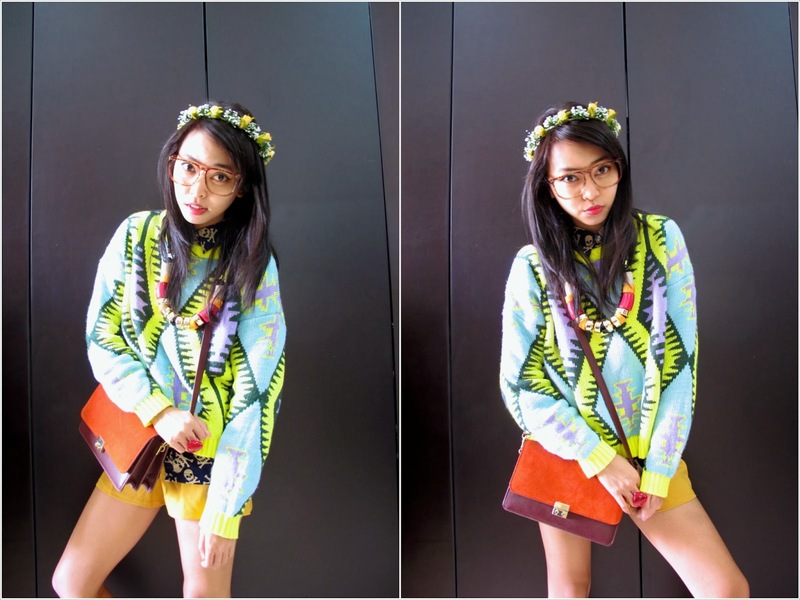 As usual, it's so simple, you just need to play with colours and patterns. 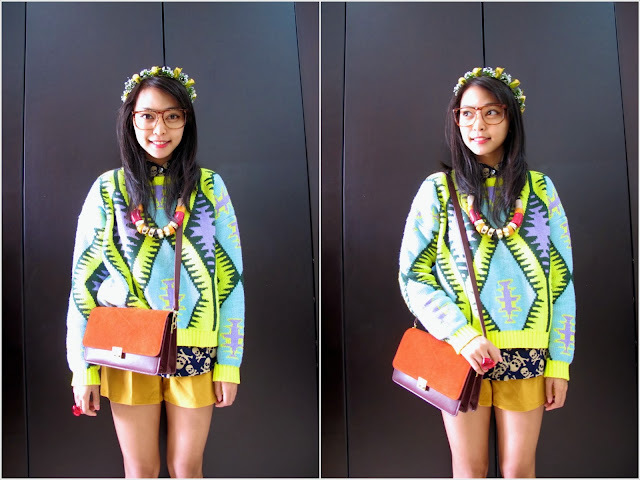 I am a big fan of sweaters and pullovers, so I am so excited when martofchine.com sent me this cute and colourful pullover. Do you know who's martofchina.com? MartOfChina.com is a China-based global online wholesaler that is a worldwide business leader in selling blue-ribbon cheap fashion clothing. From the moment they founded MartOfChina.com, their vision was to empower people worldwide in buying and selling online. Whoever you are, and wherever you are, Martofchina offers the same price to all: the lowest possible. Whether you’re a retailer who refuses to pay the high prices in your country, or a shopper looking to get hold of the latest products, MartOfChina.com provides light-speed service and fantastic prices. They buy direct from an ever expanding network of Chinese manufacturers so they can keep costs low while maintaining the highest of standards. Feel free to visit their site for more tempting and good quality clothes and shoes in affordable price! Have a fun weekend y'all! Hi everyone! I hope all of you are doing great! 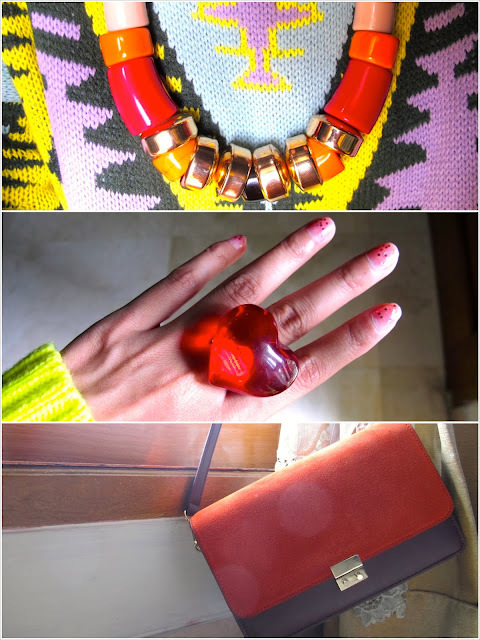 Today I am going to share my current favourite stuffs. Some of them are new stuffs and some of them I got from few months ago but still become my favourite. From my previous post, I've already mention my upcoming EOS lip balm collection in Medicated Tangerine flavour. Well, I have a super dry lips and this lip balm works amazing. It moisturised my lips! It also smells okay … I can smell something weird from it but I think it's because it is medicated, so it's not a big deal for me. I also have a dry body skin, so lotion wasn't good enough to moisturised my skin and I have to use body butter to solve my skin problem. My favourite are from The Body Shop. Most of them smells great and works well for my skin! 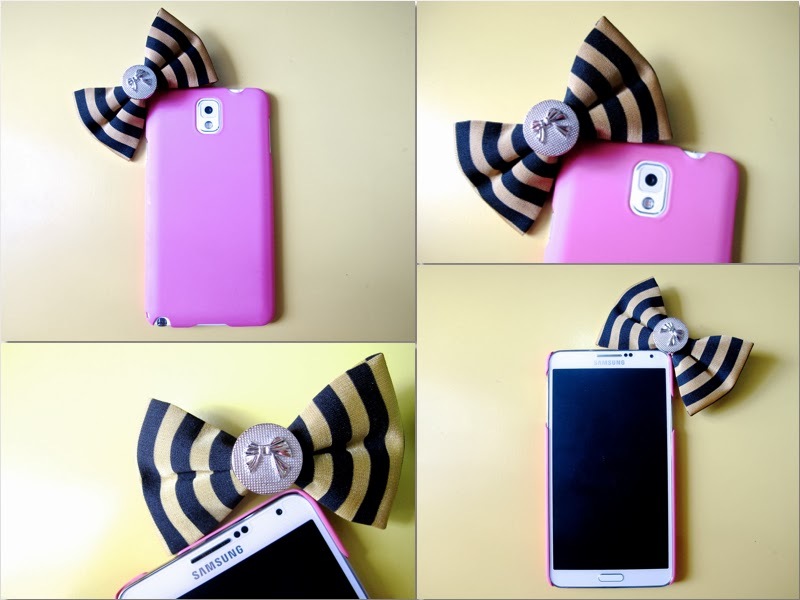 Messy bun is my favourite hair style since I am having an extreme long hair now (and I am going to salon as soon as possible and cut them off … not all of them, just want to make it shorter) so I like to use this cute bow pin on the side of my messy bun just to make it more cuter. YSL lipsticks are everyone's favourite. Their colours are adorable! This one is a lip balm. I bought it in Hong Kong few months ago. Love the smell and the packaging is cute. But, it doesn't works really well for my super dry lips … I like it and keep it because of the packaging. Yes! I just bought my Samsung Galaxy Note 3 few days ago and I love it. This is my first time using smartphone from Samsung. Not because I am a Korean lover, but it is seriously because this gadget contains many useful applications. I was planning to buy iPhone 5c or 5s, but when I saw this one and saw the comparison video between iPhone 5s vs Galaxy Note 3, I can see that iPhone is boring. I am not an iPhone hater since I am still using my 4s now. Still need to learn how to use this phone, but so far, this gadget is really cool. Decided to get the white one because the jet black colour is too masculine for me. Well, thank you for reading! Have a good day y'all. 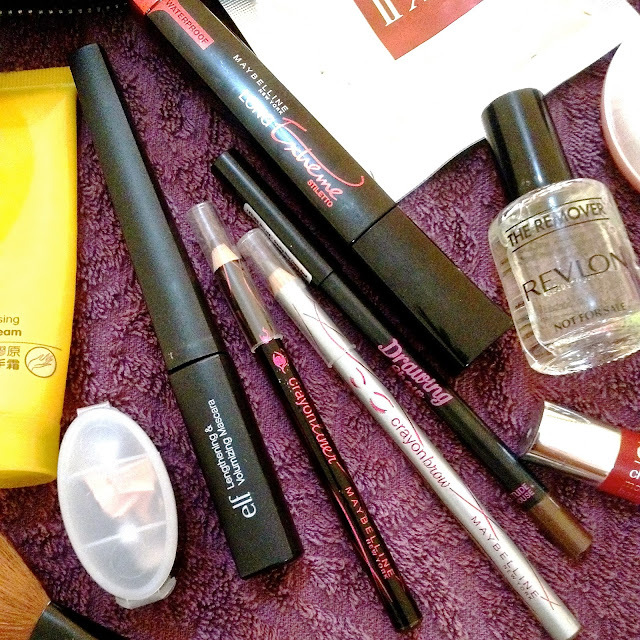 Another post about beauty products and this time I will share about my daily make up products. I am not a make up junkie but I do love to have lovely beauty products. Usually, I never put on too much make up and sometimes I go out without any make up on, just my skincare on my face. As you can see that I also have a facial mask, analgesic and hand cream in my make up pouch... just in case I need to use them. I believe that most of you have heard many raves about SK-II products and yes, I love their products, I love their facial masks and that's why I always have one in my pouch. It rehydrated my skin really well and makes my skin smooth and supple. The yellow tube is my favourite hand cream! It smells good and really moisturised my super dry hand skin. I bought it at Watsons, Hong Kong. Still can not find it in Indonesia. Akh, too bad! I also have my analgesic with me everywhere I go. I often to get headache under the extreme hot weather, so that's why I need it. SK-II face powder is one of my favourite face powders I have. I also have my Make Up Forever duo mat and 17 (I bought it in Bangkok, and it is a good compact powder). 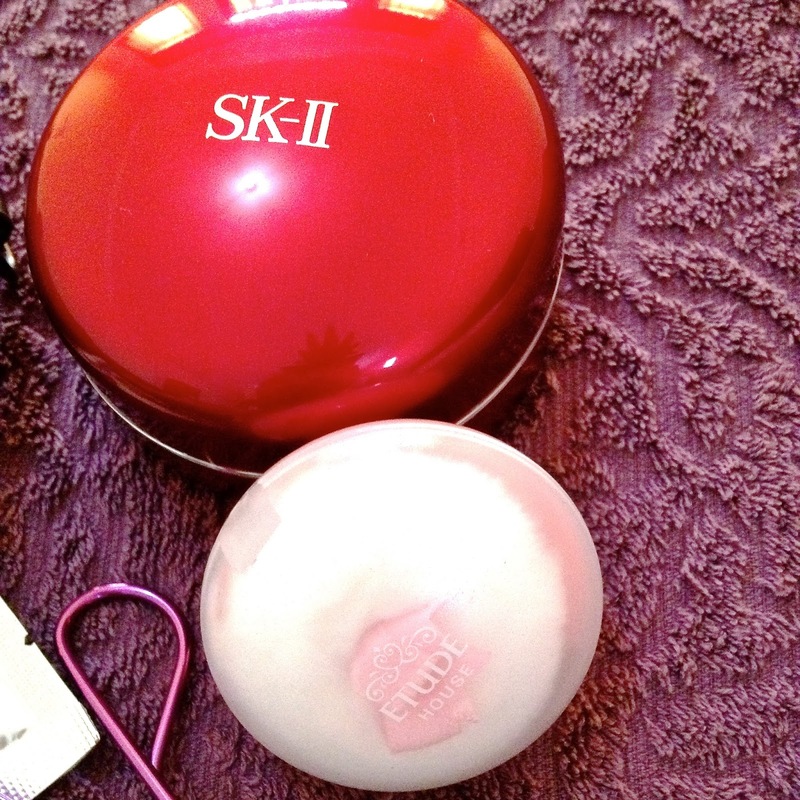 For daily make up, I use my SK-II face powder, it contains vitamin C and sunscreen (SPF 20). Two thumbs up for this product! Currently, I am living in Surabaya and the weather is extremely hot and dry. 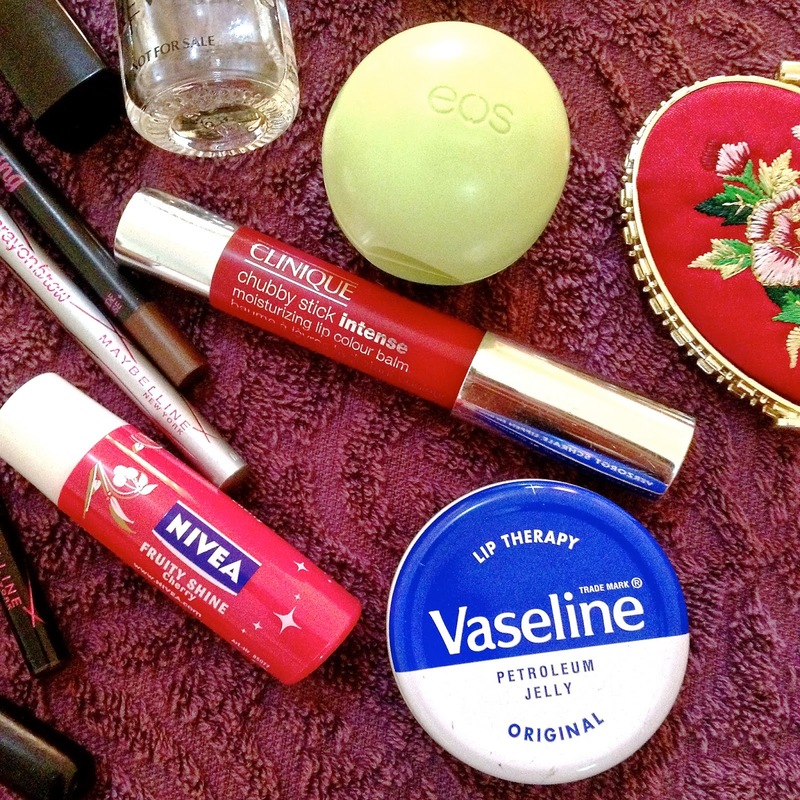 My lips and skin are became more drier and I need extra treatments to keep them moist. Next is my chubby stick moisturizing lip colour balm from Clinique. This one is another favourite because I don't need to put on any lipstick because this one comes with intense red colour. I bought this one because I lost my red colour lipstick ... also from Clinique and the colour turned out pretty the same between the lip balm and lipstick. Intense! Nivea lip gloss is another favourite and I only use it at home because it's a bit glossy and I don't really like walking around with glossy lips. The only complain about this one is the 'glossy look' thing. Another glossy lip product is this Vaseline petroleum jelly. We all know that this product is an expert to moisturised very dry lips and skin and again... the only complain is the glossy and oily look. I often apply this on my lips at night before I go to bed. And for the eyes, I only applies eye liner and light mascara and both of them have to be waterproof. Eye shadow and brow pencil are only for special occasion. For eye liner, I have lots of them mostly in brown colour, black and grey. My fave are Estee Lauder, Dior, Etude House and Maybeline. For mascara, I only have three, it's Elf, Revlon and Maybeline. The products review is based on my personal opinion, some people may like the products and some people don't... and just wanted to let you know that this is not a sponsored post. Thank you for reading and feel free to leave a comment!